the compositions within this series are inspired by several precedent-setting artists as well as my own thoughts and interpretations of a contrived ordering system, exploring a way to represent an intangible infinity. the initial thoughts of this project were memories of being within a barber’s chair as a child. two opposing mirrors entertained me while the barber would cut my hair. i was never able to understand how my reflection seemed to continue infinitely from the mirrors. i began with two prime numbers as a proportioning system, the numbers 3 and 11; these numbers having no common factor aside from the number 1 and itself. this ratio of 3:11 when divided yields an infinite decimal of 0.272727… the composition within this “infinite” window is juxtaposed to a finite proportioned square, playing upon visual weight and scale of objects in relation to each other. in a further use of these numbers i created thirty-three compositions as a factor of the numbers three and eleven again. 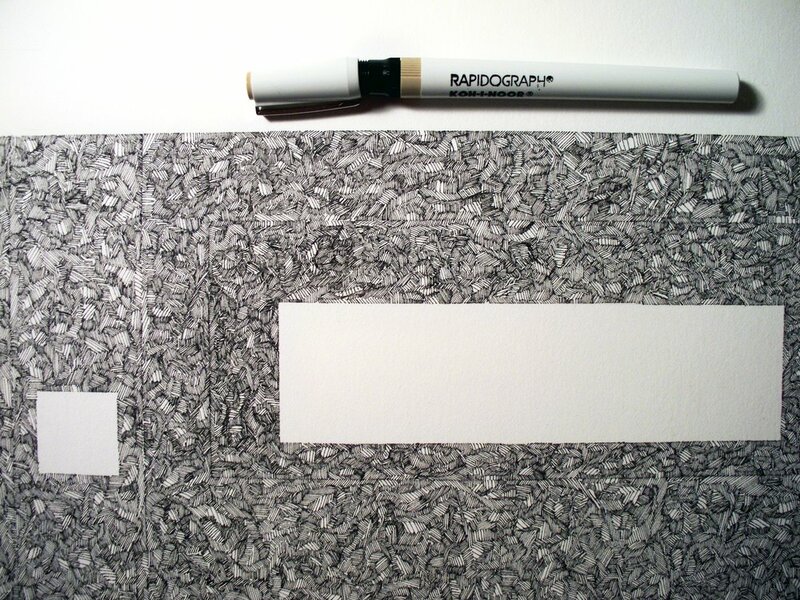 the second series of drawings are a continued interpretation of this idea utilizing the same proportions although the dimensions have changed to 6” by 22”, twice the size of the original. as these drawings progressed i became more and more interested in creating a visual texture that overwhelmed the viewer. as one scans across the drawing a viewer’s eye can begin to pick up very small cues as to underlying fields of information, it is only after intense investigation that the systems and varied proportions begin to make themselves evident. the change in size of and between the lines was a conscious decision and a search for if or when these visual cues would become more or less apparent. i enjoy artwork, whether abstract or realist, that can be interpreted on several levels. i enjoy the effort to understand the artist’s intention and underlying system of thought. as most careers have become dependant upon the use of computers and continually separate their users from the act of making, i will continue to believe in the beauty of an imperfect mark made by an imperfect being. "yet it is in this loneliness that the deepest activities begin. it is here that you discover act without motion, labor that is profound repose, vision in obscurity, and, beyond all desire, a fulfillment whose limits extend to infinity." "man is equally incapable of seeing the nothingness from which he emerges and the infinity in which he is engulfed." "if any philosopher had been asked for a definition of infinity, he might have produced some unintelligible rigmarole, but he would certainly not have been able to give a definition that had any meaning at all." “for art is always the final generalization, it must provide the implications of infinity to any situation. and if our own environment is too diverse to allow a philosophical unity, it must find some symbol to express at least the desire for one”.